A secluded community in the heart of S. Baton Rouge for those desiring to “right” size without compromising quality & style. Located in the heart of South Baton Rouge, on Jefferson Highway near Bluebonnet, Artisan Hill is a secluded 24 lot neighborhood surrounding a beautiful pond. Artisan Hill is minutes away from Towne Center, Whole Foods and Baton Rouge Country Club, offering a variety of great shopping and dining experiences. With easy access to major medical and the interstate, residents in Artisan Hill will appreciate the gated entrance and direct garage access into their home to respect the privacy of the community's homeowners. 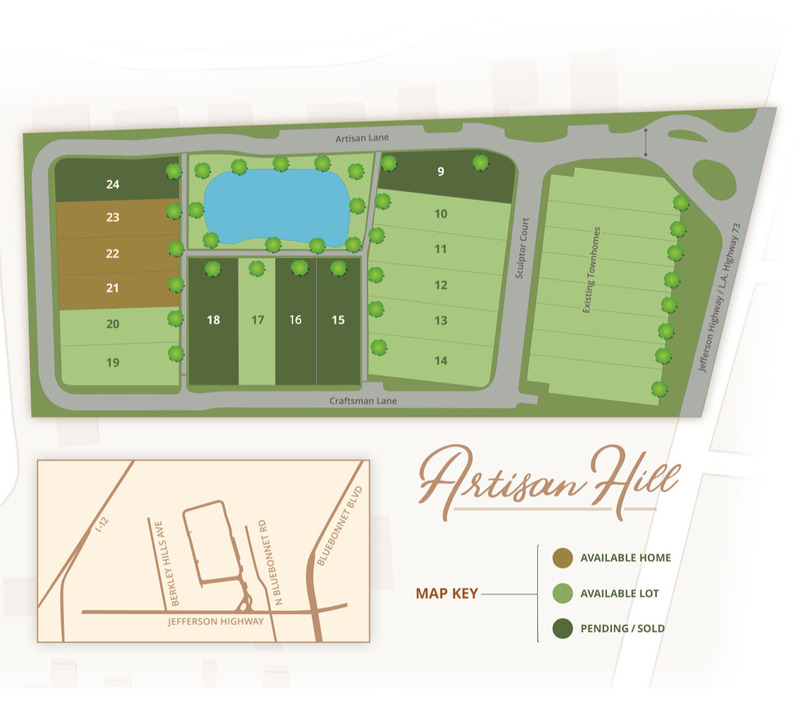 Artisan Hill continues the tradition of thoughtful attention to detail with plans ranging from 1800 to 2800 square feet, for those who desire to “right” size without compromising quality and style. Each home is energy efficient and low maintenance while maximizing usable space with extra closets for storage, optional office, and master suites on ground floor. Sidewalks and front porches encourage community living and offer escape from the hustle and bustle of city life; a chance to “Live Life Vividly”. 16 Homes starting at $425,000. For more information about homes and sales, call Heather Kirkpatrick with EXP Realty at 225-252-0668.